Ugh! Flu season is here and it's not looking good! Wouldn't it be nice if you could sit down with a calendar and decide on what days would work best for you to catch a cold or get the flu? Then you can be completely prepared for it and have everything you need to help you get through it. Unfortunately it doesn't work that way. Usually you get sick when you least expect it. One day you're feeling great and then you wake up the next day feeling completely miserable. And lets face it, the last thing you want to do when your sick is drag yourself to the store to get medicine, soup, and anything else you may need to get you through the next couple days. That's why this cold and flu survival kit is so great! Once you put this kit together, keep it in a place that is easy to access. Whenever flu season rolls around and you do get sick, you will have everything you need in one handy container. 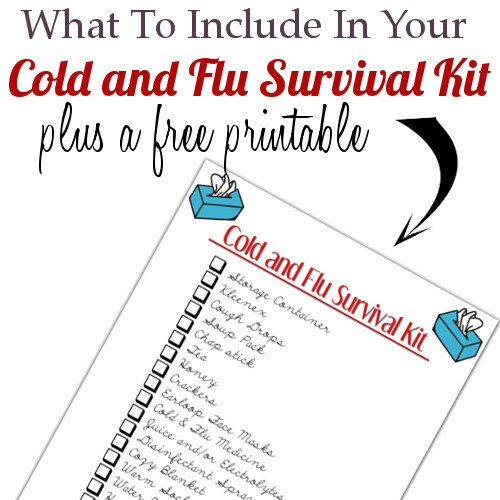 Today I'm sharing a list of items to include in your cold and flu survival kit as well as a free printable to keep with you kit. Storage Container - To store items for your cold and flu survival kit. Kleenex - For runny noses. Cough Drops - Soothes sore throat. Soup Pack - Simple to make, easy to eat, and may help with a sore throat. Chap stick - To keep your lips hydrated. Tea - Help to soothe a sore throat and keeps you hydrated. Honey - Soothes sore throat and calms irritating coughs. Choose raw and unfiltered for best results. Crackers - To snack on. Earloop Face Masks - To keep germs to a minimum. Cold & Flu Medicine - DayQuil & NyQuil, Tylenol, Mucinex, or whatever your preferred medicine of choice is. Juice and/or Electrolytes - To help keep you hydrated. Cozy Blanket - To keep you warm and comfortable. Warm Socks - To keep you toes warm. Water Bottle - To help keep you hydrated. Hand Lotion - Keep your skin hydrated. Small Trash Can - Because the last thing you want to do is walk to and from the trash can a billion times. Plastic Bags - To line the trash can and contain germs. Recycled grocery bags work great for this. Epsom Salt - Will ease sore muscles and help you sleep better. Chocolate - Because you're sick and you deserve it. Buy items online in bulk to make multiple kits and gift out to friends and loved ones. Go through the medicine every couple of months and replace anything that has expired. After being sick, replace products as necessary before putting your kit away so that it will be full the next time you need it. Have you caught the flu this year? What are your best survival tips? 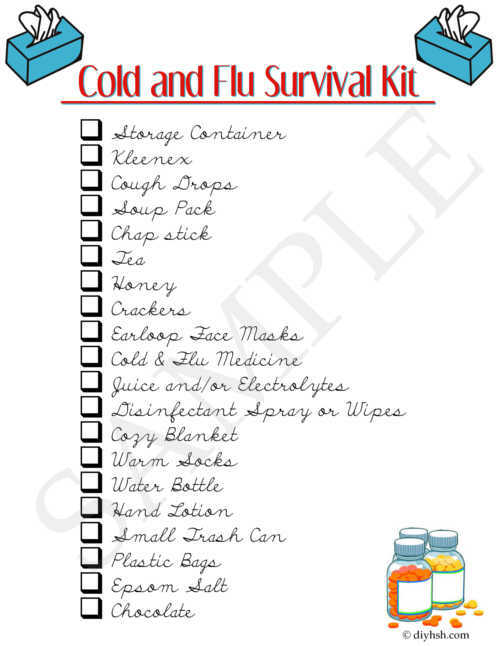 Are there any other items you would add to this flu kit? Thanks for the free downloads you offer. I appreciate you. My daughter will get good use of this list. With 5 kids, it is easy to lose track. This will help. Thanks! You're welcome Dots. I hope your daughter will find it useful. this is a great list, and a terrific gift idea! taking notes and pinning :) thank you! Great list of items! I am pinning this now! Great printable! Thank you for sharing on Merry Monday! Hope to see ya next week! How about a thermometer ? Yes!! I'm not sure why I didn't think of that. Thank you for listing out all the essentials. As a new mother, its a constant worry for me when my son will get sick. This survival kit is perfect. Thank you!